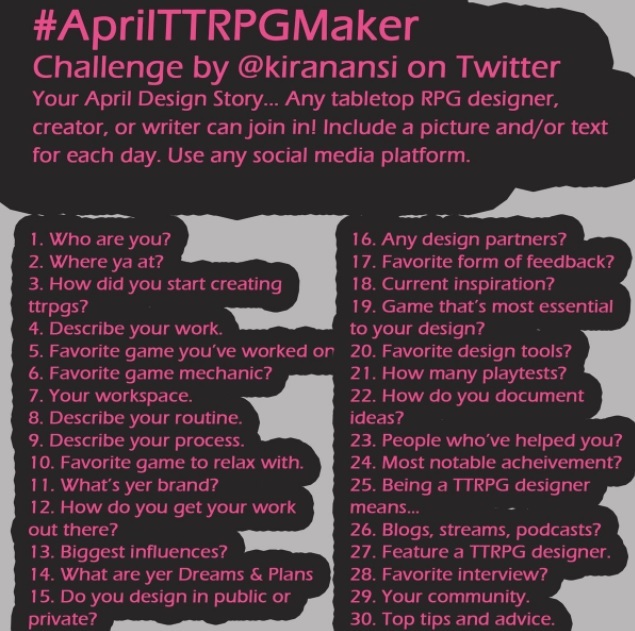 April TTRPG Challenge Day 11: What’s Yer Brand? The weird thing is I talk about this a lot with my non-fiction but not so much my RPGs. Over there, my brand is best summed up as; articulate, professional enthusiasm. I’m an open mind cultural analyst who enjoys things AND stuff. I’m always up for trying something new and always entranced by the conversation with my own taste that leads to. No one gets left behind. Everyone gets something to do. Not everyone has to die. I’ve been the player who gets left behind. I’ve been the GM who gets left behind. I’ve been the character who has noting to do. I’ve been the character who’s died so the situation can escalate. None of those things are fun. None of them have to happen. And that’s what a lot of my work is based on as a principle so, I guess my brand is hopeful action-packed clever enthusiasm. Yeah, that sounds about right. Next April TTRPG Challenge Day 12: How Do You Get Your Work Out There?